MacOS X v10.12 (Sierra) or higher. Internet connection for downloaded installation and product updates. 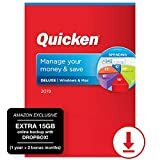 Amazon Exclusive: 15GB of EXTRA DROPBOX (20GB total) along with an 2 bonus months of Quicken (total of 14 months), backed by our 30-day money back guarantee. SAFE AND SECURE: You can rest easy knowing that your business's sensitive data is protected with bank-level security information with Sage 50 Premium. User-end security features ensure only authorized logins to your Sage Premium account. MANAGE JOBS AND EXPENSES: Easily keep track of your customers' projects with quotes and proposals that easily convert into invoices and sales orders. Track all your expenses for a single project in one place to keep your budget and customers happy. EASY INTEGRATION: Sage 50 Premium Accounting Software 2019 integrates seamlessly with Microsoft Productivity Tools, including Word and Excel so you can import and export crucial data with a familiar and easy-to-master interface. 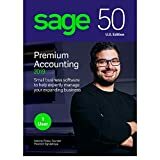 Sage 50 Premium Accounting 2019 is the advanced accounting software you need to take your business to the next level. Built-in checks and balances ensure your financials are accurate and your information is available anytime and anywhere for you and your accountant. Our streamlined interface is easy to master, and built-in accounting best practices keep your business finances on track and help you stay compliant with taxes and reporting requirements. One-click reports can be accessed anywhere, anytime, so you can rest assured that your business is in solid financial shape. Sage 50 Premium lets you track everything – not just payroll – in one place. Manage your inventory on hand with the same software you use to handle payroll and customer invoicing. Tools to analyze customers, inventory, and employees are built r in, so you can manage everything. Easily build your team by adding additional users to your Sage 50 Premium account, so you can authorize as few, or as many, users as you need. Share full access with other individuals or set the control features on Premium to delegate certain features. The flexibility of Sage 50 lets you decide User-level security prevents unauthorized logons and keeps your vital information secure. We’ve developed the best in bank-level online security, along with the ability to archive old records so you can keep your main operating system operating quickly. Sage 50 Premium is easier to use and takes advantage of the business software you already use. Simply import your contacts from Outlook and then easily export detailed reports into PowerPoint or Word or import spreadsheets. Our familiar, intuitive desktop interface provides all the features you need to organize your finances, pay bills and get paid, manage inventory, handle projects, and manage your cash flow and costs. Over 100 pre-loaded reports make it simple to get started, while automatic updates ensure that your software doesn’t lag behind. Designed for do-it-yourself customers who want to be in control of their tax preparation experience and feel empowered by completing their own return. They are educated and cost-conscious, want to get the biggest refund possible, and are comfortable e-filing. They are often homeowners, investors, or both. H&R Block Deluxe Tax Software offers everything homeowners and investors need to easily complete federal and state taxes, including step-by-step guidance and FREE tax advice via online chat. (1) Individual returns only. You can ask our tax advisors unlimited questions at no extra cost during regular chat hours. 2) Free audit support is available only for clients who purchase and use H&R Block Tax Software to prepare and file their 2017 individual income tax return. Terms and restrictions apply; see www.hrblock.com for details. (4) Additional personal state programs are extra. Most personal state programs available in January; release dates vary by state. (5) State e-file not available in NH. 2017 HRB Digital LLC. All rights reserved. H&R Block DeductionPro and H&R Block are registered trademarks of HRB Innovations, Inc. TurboTax and Quicken are registered trademarks of Intuit, Inc. For sale by authorized resellers only.